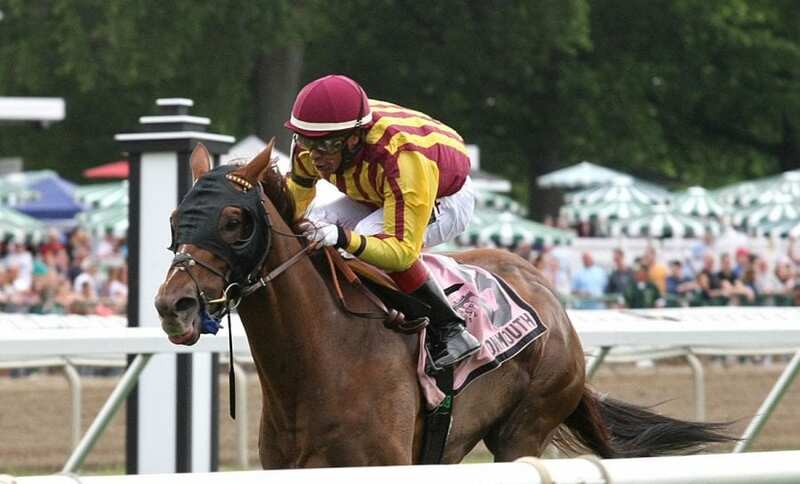 Irish Strait earned a win in the Grade 3 Red Bank Stakes at Monmouth Park. Photo by Ryan Denver/EQUI-PHOTO. Twelve months after becoming a graded-stakes winner in last year’s renewal, Juddmonte Farms’ homebred Projected takes aim at a repeat performance in Saturday’s $200,000 Baltimore-Washington International Turf Cup (G3) at Laurel Park. The one-mile BWI Turf Cup for 3-year-olds and up is among six stakes worth $650,000 in purses on a 12-race ‘Class on the Grass’ program that also includes the debut of the $150,000 Bald Eagle Derby for 3-year-olds going 1 ½ miles. Also scheduled to be run over Laurel’s world-class turf course are a pair of $75,000 stakes for Maryland-bred/sired horses at 1 1/16 miles – the Find for 3-year-olds and up, featuring Maryland’s 2017 Horse of the Year Just Howard, and the All Brandy for fillies and mares 3 and older. Carded on the dirt are the $75,000 Challedon for 3-year-olds and up and the $75,000 Shine Again for females 3 and older, both at seven furlongs for non-winners of a sweepstakes. First race post time is 12:30 p.m. The BWI Turf Cup is carded as Race 7, with a post time of 3:30 p.m. Projected capped his 5-year-old season in the 2017 BWI Turf Cup, rating well back while third through a half-mile before being swung outside and commencing a run that culminated in a 1 ¼-length victory as the favorite. The gelded son of Showcasing is the only horse returning from last year’s race. This year Projected has finished second or third in each of his five races, all in stakes, beaten a total of 4 ¼ lengths. Most recently he was third by a head in the 1 1/16-mile Bernard Baruch (G2) Sept. 3 at Saratoga, a race where he took a one-length lead into the stretch before being denied in a three-way photo finish. Joe Bravo is named to ride Projected from Post 7. All horses will carry 120 pounds. Isabelle de Tomaso’s homebred Irish Strait, older half-brother to recently retired multiple graded-stakes winner Irish War Cry, enters the BWI Turf Cup after rallying to be third, beaten less than three lengths, in defense of his 2017 triumph in the one-mile Red Bank (G3) Sept. 1 at Monmouth Park. It was the second straight third-place finish to Synchrony in a Grade 3 for 6-year-old Irish Strait following the 1 1/16-mile Oceanport July 29. He hasn’t been worse than third in four tries this year, his lone win coming in the Dan Horn Handicap June 17. Both races came at Monmouth; he is 0-for-3 lifetime over the Laurel turf, running fourth in the Henry S. Clark Stakes last April. Jorge Vargas Jr. has been named to ride Irish Strait from Post 9. Finishing second at odds of 12-1 in the Red Bank, a length and a quarter ahead of Irish Strait, is Gil Campbell’s Stonehedge homebred Abiding Star, a multiple stakes winner on dirt as a 3-year-old that is looking for his first black-type score on turf. Abiding Star owns three wins in nine career tries on grass but is 0-for-4 this year, running second and third in a pair of optional claiming allowances over the summer at Belmont Park, the latter to graded-stakes winner Blacktype July 5 in just his second start. Marc Detampel’s Siem Riep has finished in the money in seven of his eight 2018 starts including three consecutive runner-up stakes finishes in the Midwest. He was beaten less than two lengths in each of the 1 1/16-mile Warriors Veterans July 14 at Indiana Grand, the Kentucky Downs Preview Tourist Mile Aug. 5 at Ellis Park and the one-mile, 70-yard Old Friends Sept. 6 at Kentucky Downs. Three of the 4-year-old Tapit gelding’s five career wins have come at the mile distance, most recently in an optional claiming allowance June 23 at Churchill Downs. The BWI Turf Cup will mark his debut at Laurel, his 12th different track in 17 starts. He ran fifth in his unveiling last May at legendary Pimlico Race Course. Named for a city in Cambodia, Siem Riep will have the services of Feargal Lynch from Post 6. Completing the field are Oceanport runner-up Doctor Mounty, a three-time winner at Laurel that ran second in the Henry S. Clark Stakes in April for Hall of Fame trainer Shug McGaughey; 2017 Play the King (G2) winner Conquest Panthera; 2017 English Channel Stakes winner Dalarna; two-time Grade 3 winner Night Prowler; Laurel-based O Dionysus, a stakes winner on dirt and turf; and multiple stakes winner Grasshoppin, entered for main track only.